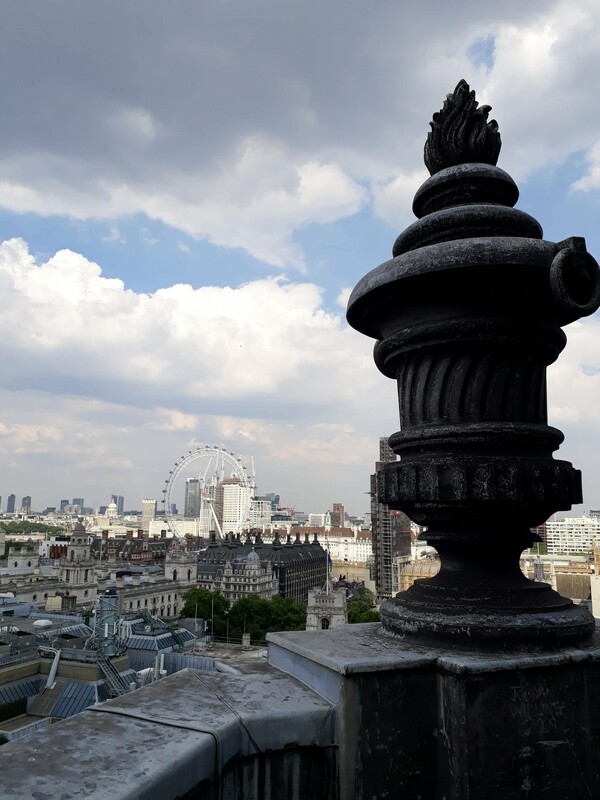 The final workshop of the AHRC Conferencing the International Project took place on the (very warm) afternoon of 5th July 2018 in Methodist Central Hall in the heart of Westminster. The workshop brought together sixteen academics, civil servants and representatives from charities and political organisations to discuss what makes a city, and specifically the city of London, function effectively as a venue for international events, from conferences and congresses to exhibitions and concerts. 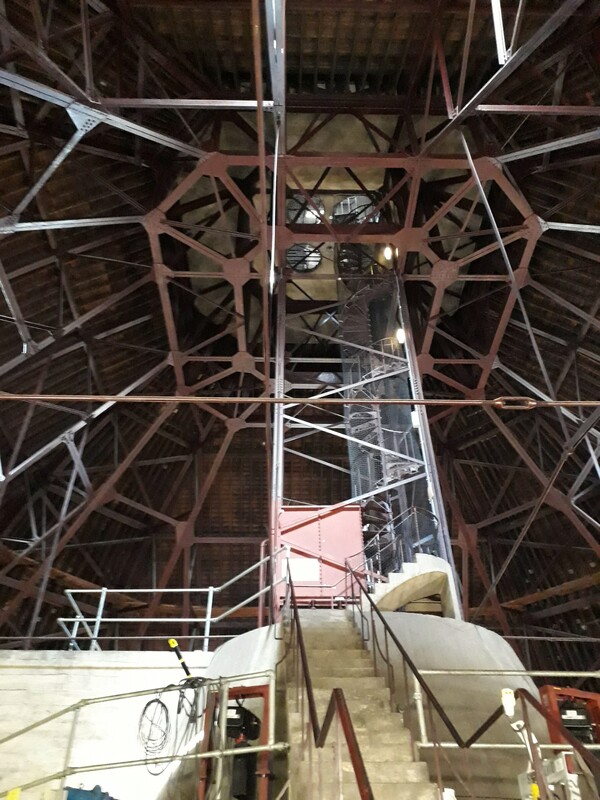 The objective was to explore how the spaces of London’s internationalism, including those of Central Hall itself, have reflected the range of imperial, liberal and radical currents of thought we have discussed in other aspects of the project, as well as the familiar tension between national and international ideals. The wider idea was to explore how urban built environments enable and constrain the development of internationalism, drawing on the expertise of governmental and non-governmental practitioners involved in organising international meetings in London and elsewhere. Three themes (and associated questions) were circulated in advance of the workshop on the making and unmaking of international spaces in urban environments; the infrastructural geographies within and between international urban venues; and the sensory experiences, behaviour and comportment of international visitors. The opening session began with thoughtful presentations from Stephen McGowan, Head of Events at the Department for International Trade, and Reshaad Durgahee, Africa Operations Lead in the same department. Both reflected on how this most recent, post-Brexit government department has sought to organise, and benefit from, international conferences, exhibitions, expositions, trade fairs and the like. Stephen concentrated on British involvement in larger, set-piece international events such as global investment summits and the recent world expositions, providing many interesting details along the way about the origins, impact and afterlife of the UK’s ‘bee hive’ exhibition at the Milan Expo in 2015 and the plans for the British pavilion at the Dubai exposition in 2020. Reshaad focused on the more intimate, though no less complex bilateral trade and investment events he has organised or attended in London and elsewhere, including receptions at the Foreign Office’s Locarno Room and Lancaster House. Both speakers reflected on the unforeseen challenges and unintended outcomes of these events, and the role of atmosphere, timing, surroundings, lighting, the selection of food and drink, the ceremonials associated with welcomes, gift-giving and receiving, the balance between formal and informal processes, and the wider significance of space, place and environment in determining how events unfold. A lively debate ensued that ranged across other topics, including the use of works of art and furnishings in setting the tone and flavour of events; the unpredictable nature of events that escape the intentions of their organisers; the process of checking venues to avoid diplomatic embarrassment (former imperial capitals are filled with spaces that have unfortunate historical associations long forgotten by local civil servants which are vividly recalled by informed visitors from other countries); on how and why events are hailed as successful or dismissed as failures; on the institutional memory and historical awareness of previous governments attempts at event management (apparently very weak); and about whether internationalism, at least in the UK, is now determined more or less exclusively in ‘bottom-line’ economic terms, and through a new, post-Brexit ethos of bilateralism rather than genuine multilateralism. The second session featured presentations from KCL historical geographer Ruth Craggs, and from Amitav Banerji, of the Global Leadership Foundation (GLF). Ruth made several penetrating observations drawing on her research on Commonwealth conferences in Singapore (1971) and Lusaka (1979), contrasting these with the latest meeting of Commonwealth Heads of Government (CHOGM) in London earlier this summer. While exploring how each of these events generated unforeseen outcomes, sometimes positive, sometimes less so, Ruth noted that public protests and oppositional politics are now as firmly associated with Commonwealth conferences as with G7 and other international summits. Protests are, of course, often directed towards the domestic policies of host governments, and are intended to capitalise on the presence of the world’s media. Recent controversies about the treatment of Windrush migrants to the UK, whose plight was brought into sharper relief by the presence of Commonwealth heads of state at the 2018 London conference, were discussed in some detail. Amitav provided some extraordinary insights, based on long experience in organising international events while working for the Indian diplomatic corps, the Secretary-General’s Office at the Commonwealth Secretariat, and latterly the GLF. This is a small but important organisation established by F. W. De Klerk, President of South Africa from 1989 to 1994 and the Deputy President to Nelson Mandela from 1994 to 1996, after his retirement to provide former heads of state with a forum by which they can discreetly pass on their wisdom and experience to current governments around the world. Like Ruth, Amitav considered the complexities of ‘soft power’ and reflected on the role played over the years by the British monarchy in providing a seemingly apolitical figure for the Commonwealth, one that reinforces the organisation’s familial political language and self-consciously domestic forms of political encounter based on carefully selected private spaces into which senior politicians often ‘retreat’, freed from officials, minute-takers and other distractions, to establish more personal and human relations. The ‘retreat’ has been deployed more widely, of course, notably for bilateral negotiations facilitated in the past by the United States, where the Presidential retreat at Camp David (officially known as Naval Support Facility Thurmont) has been the location for several attempts to broker Middle East peace deals. Successive British governments have also used the Prime Minister’s official country residence at Chequers, a 16th century manor house in Buckinghamshire bequeathed to the government during World War One by Viscount Lee of Fareham as a tacit acknowledgement that future prime ministers were less likely to have access to their own private rural retreats where important affairs of state could be discussed in domestic privacy. The latest chapter in the chequered history of Chequers as a location for ‘retreat’ style governance unfolded the weekend after the workshop when Prime Minister Theresa May gathered together her senior government ministers, minus their advisers and even their mobile phones, in a last-ditch attempt to establish a unified Cabinet position on Brexit, a démarche which, at the time of writing, seems to be unravelling already. These two presentations provoked further spirited discussion on the differences between Commonwealth and UN conferences, and indeed on the forms of internationalism these multilateral organisations now represent. In a reprise of earlier discussions at the end of the first session on the economic foundations, and limitations, of 21st century internationalism, now arguably (over)determined by trade and finance rather than politics, culture and social concerns, the workshop also reflected on a question raised by Sanjay Srivastava about the role of private sector corporations in funding, organising, and staging international political events that nation-states and financially stretched international agencies are no longer able or willing to co-ordinate themselves. A larger question emerged here: are we perhaps confronting new and more complex forms of 21st century internationalisms that are no longer determined, or even influenced, by the liberal multilateral organisations that have shaped the international order since 1945? At a time when these organisations – the UN, NATO, even the EU – are seriously compromised by resurgent nationalisms and populisms that are openly hostile to all forms of globalism, will be the international ‘vacuum’ be filled by business and global corporations willing to organise and fund forms of political engagement and interaction that serve their interests, whether bilateral or multilateral. 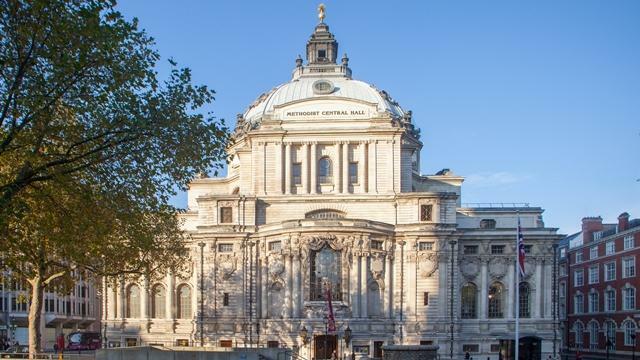 Central Hall, located opposite Westminster Abbey, was selected for this workshop because of its own rich history as an international venue. Built from an impressive fund acquired by a subscription scheme to which a million Methodists from across the UK contributed no more and no less than the single guinea standard fee, Central Hall has hosted some of the most important international meetings, conferences, rallies, concerts and exhibitions that have taken place in London since the building’s completion on the eve of World War One, including meetings associated with the League of Nations, the 1921 London Pan-African Congress (studied by Jake Hodder), and the first meeting of the United Nations General Assembly in 1946. This rich story was outlined in a fascinating concluding presentation from Paul Moynihan, the Central Hall archivist, who also led the group on a tour of the building that culminated with a visit (via an amazing spiral staircase set within the famous cupola) to the uppermost external balcony which affords one of the finest 360 degree views of London anywhere in the city. 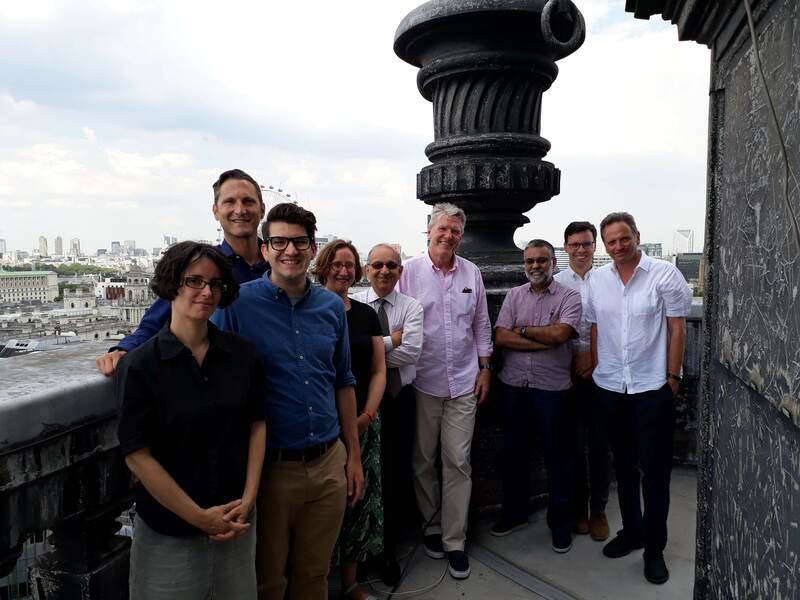 The workshop was attended by Amitav Banerji (Global Leadership Foundation); Richard Bourne (Round Table Board); David Brydan (History, Birkbeck College); Ruth Craggs (Geography, KCL); Pete Docking (History, KCL); Reshaad Durgahee (Department for International Trade); Mike Heffernan (Geography, University of Nottingham); Jason Dittmer (Geography, UCL); Jenny Henderson (Event Manager, Central Hall); Jake Hodder (Geography, University of Nottingham); Mark Lambert (Ministry of Housing, Communities and Local Government); Stephen Legg (Geography, University of Nottingham); Stephen McGowan (Department for International Trade); Paul Moynihan (Archivist, Central Hall); and Sanjay Srivastava (IEG, University of Delhi).